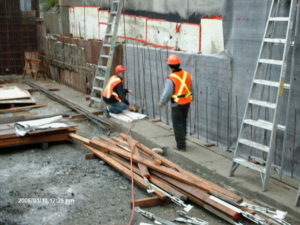 Foundations – Nu-Tech Roofing & Waterproofing Ltd.
Nu-Tech Roofing “waterproofs” foundation walls. This is a significant upgrade from “damp-proofing” approaches. 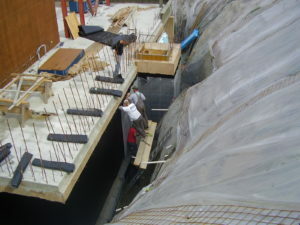 We install highly reinforced roofing grade membranes on the vertical walls that are able to withstand substrate movement, hydrostatic water head, and are strong and durable to provide lasting service. 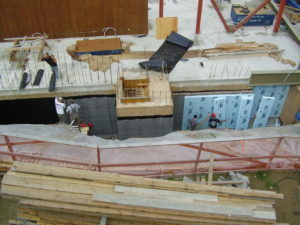 In many applications the foundation wall is protecting an interior environment and we also provide exterior insulation and drainage mats/protection boards to complete the wall assembly. 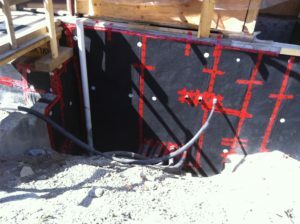 Further, many foundation walls now have multiple penetrations for mechanical/geothermal systems. 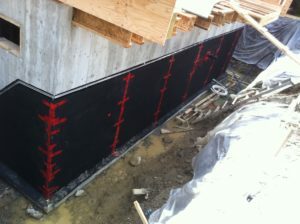 Our waterproofing membranes can be accurately and permanently detailed to these penetrations providing reliable protection.